Rupani released three zoo-bred Asiatic lions in the safari park, located in Gir (East) forest division near Dhari in Amreli district. Chief Minister Vijay Rupani at Ambaradi lion safari park in Amreli on Tuesday. 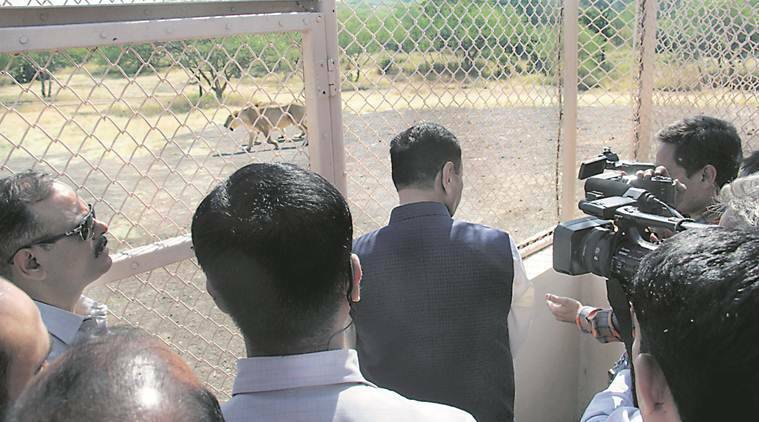 Five days after the Gujarat High Court cleared the decks for the lion safari park at Ambardi in Amreli district, Chief Minister Vijay Rupani on Tuesday formally threw open the park. Rupani released three zoo-bred Asiatic lions in the safari park, located in Gir (East) forest division near Dhari in Amreli district. The park has been developed by carving out around 400 hectare or four square Km area out of Ambardi reserved forest. A wire fencing separates the park from the reserved forest located on the bank of river Shetrunji behind Khodiyar dam. Last week, the High Court dismissed a PIL filed by one Biren Pandya who claimed that Gujarat government did not have required permission from Central Zoo Authority (CZA) for opening the park. Pandya had claimed that the final clearance for the park was given by a technical committee of the CZA. However, early in June this year, the CZA accorded final approval to the park. Disposing of the PIL, the High Court noted that the authorities had obtained relevant permission for the safari park. Rupani said that the opening of Ambardi safari park will decrease pressure on Gir National Park and Sanctuary at Sasan and Devaliya Safari park. “The reduced tourist footfall at Sasan and Devaliya will augur well for their ecology without adversely impacting eco-tourism,” said Anirudhha Pratap Singh, chief conservator of forests of Junagadh wildlife circle. Gir forest and other protected areas spread over Junagadh, Gir Somnath, Amreli and Bhavnagar districts in the Saurashtra region are the only natural habitat of Asiatic lions in the world. A 2015 census had estimated the population of Asiatic lion to 523.